Seattle operator and pinball enthousiast Dominique John is also working since a few years on his own custom pinball machine. What makes this really interesting is that he doesn't use the latest technologies, but similar to Henk de Jager, he has chosen also to create an electro-mechanical pinball machine. Some more info is on his homepage. Can you give a short introduction who you are and what you do ? Hummn. born 1964. started operating e-m pins in '97. Also play drums & make collage art. Who am i? Uh, skinny boy, frequently uncomfortable in social situations, good dresser. 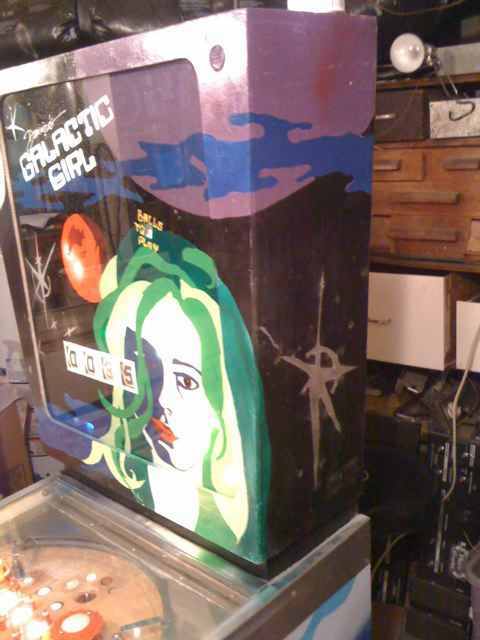 Do you have other pinball machines ? 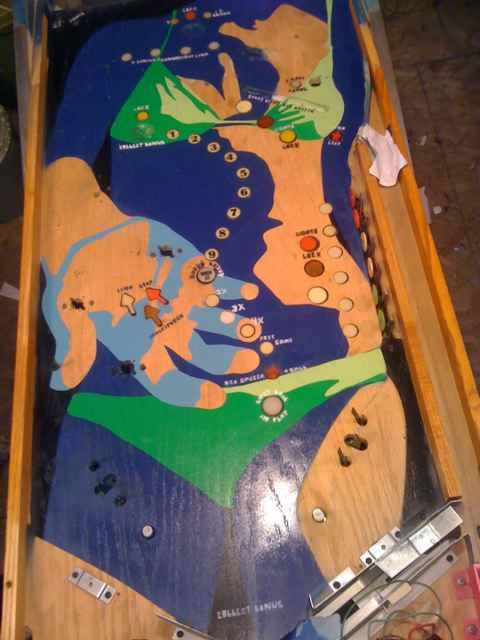 How did you get interested into pinball ? Still operating about a dozen e-ms. Fascinated as a youth by pinball. 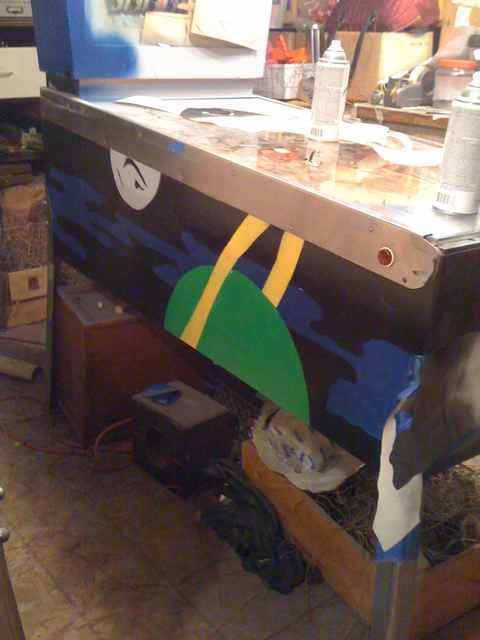 How did you get the idea of making a custom pinball machine ? Built 'pinball' games at early age out of cardboard boxes. Seems like the idea was always there. Maybe because i didn't have one, i had to make one. Also, have always been interested in vending machines, as well as how things work in general, (not so much cars). Liked the idea of getting people to give me their change. Is the game based on an existing game or your own design ? What did you create by yourself ? Playfield layout, ruleset, look/art, sound design, lighting. Do you work on the game all by yourself or do you get help ? Pretty much alone. A little help with the plastics & cable clean-up at the end of the project. 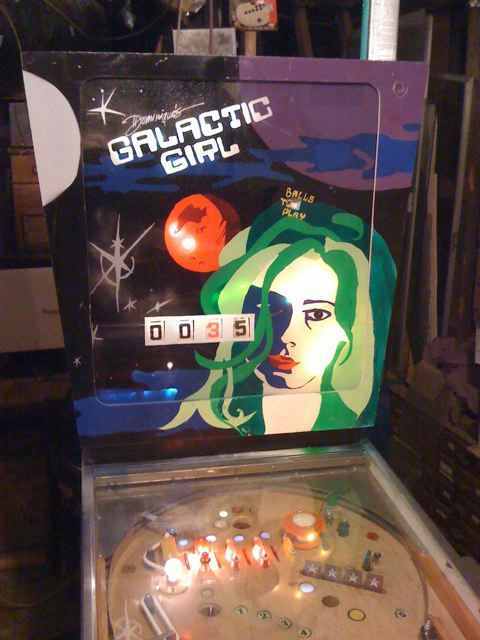 What are your favorite pinball machines and designers ? em Jumping Jack, have enjoyed many older woodrail stupid hard games. I like a lot of games, these are more formative. For how long have you been working on the project ? started over 10 years ago with pf design drilled and a basic idea of the ruleset i wanted. about 3 years ago i picked it up and worked earnestly at making it a reality. I like that the artwork continues on the cabinet. Do you have a special reason for this ? seemed natural. never really thought about it. 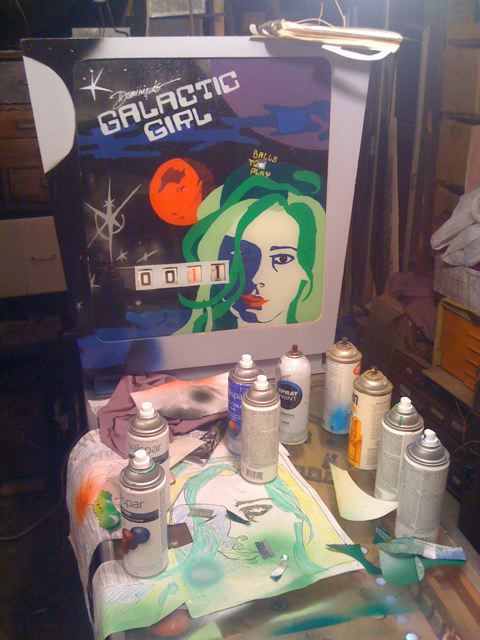 the basic idea for the giant girl was my girlfriend's. the hand is actually hers. The body and head i couldn't get to work from the photos i took, lack of contrast, hard to get right angle. Ended up using some picture out of a magazine. Don't recall who's head i used. 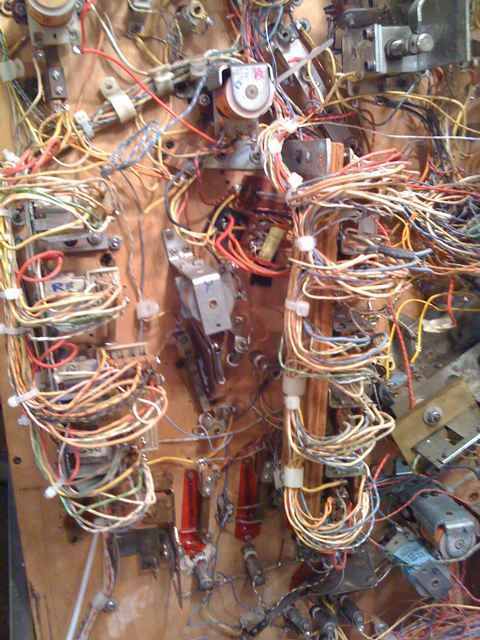 A look at the complex wiring underneath the playfield.